Visit Lehman's in Kidron, Ohio, for unique and one-of-a kind items. Many Northern Ohioans might not have heard of Lehman’s — after all, it is located in Kidron, about an hour south of Cleveland — but it truly is a wonderful place. A gathering spot for all ages, you usually will see three to four generations on any given day in the store. People from all over the world visit the massive 35,000-square-foot location. It’s easy to spend all day at Lehman’s, partly because of the welcoming and relaxed atmosphere, but also because of how much there is to see and do. A true one-stop shop, Lehman’s carries products from the following categories: farm, garden & tool; health & wellness; home & décor; kitchen & food; lamps & lighting; stoves & appliances; toys, books & games — and more. Parents and kids will love the Toy Barn area in Lehman’s Kidron location. What started in 1955 as a small hardware store serving the local Amish population has grown into something much bigger than founder Jay Lehman ever dreamed. In 2006, the family-owned business expanded the brick-and-mortar location to the size of its current footprint. Lehman’s also operates a hearty e-commerce business through its website, lehmans.com. The company’s goal is to allow customers to embrace the past, from old-fashioned treats and sodas to practical, non-electric goods that help you live a simpler life regardless of where you call home: city, country, rural or urban. Lehman’s caters to missionaries, homesteaders, environmentalists, second home owners, and even the chronically nostalgic. 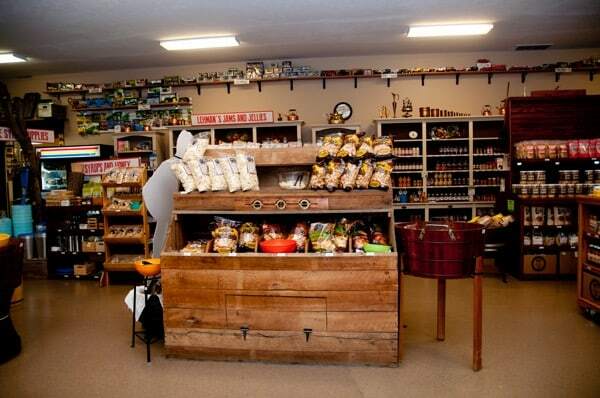 Its location is in the heart of Ohio’s Amish Country and you cannot find some of its items anywhere else. In fact, several local Amish vendors sell products in Lehman’s. Glenda Lehman Ervin, the vice president of marketing, enforces the “Why?” of Lehman’s; at the end of the day it is what tells their story. From heat stoves and wood stoves to ranges and grilling needs, Lehman’s has it all. Ideal customers focus on getting prepared for months without traditional forms of power. By doing this, they also are saving money since they are living frugally. A serious Lehman’s customer will purchase everything needed for heat, food, light, and water. Furthermore, wooden toys, board games, and scented candles are must-haves for the simpler life. All of this doesn’t mean that there isn’t something for everyone — including bakers, gardeners, grillmasters and more — it is nearly impossible to leave empty-handed. The first thing that caught my eye was a fun water pump just outside the garden area. Kids — or adults, for that matter — can learn how to manually pump their own water; it definitely is a great hands-on item for those who aren’t familiar with this type of living. Lehman’s also hosts weekly events and a range of classes that cover a variety of topics, such as Candlemaking 101, Soapmaking 101, Beekeeping 101, or Canning & Preserving, among others. Once you’ve browsed the nearly quarter-mile of inventory in the main store and refueled in the store’s Cast Iron Café, head over to the adjacent Lehman’s Outlet to find great deals on close-outs, overstocks and clearance items. Lehman’s is open from 9 a.m.-6 p.m. Monday through Saturday (closed Sunday) from June through December. January through May, hours are 9 a.m.-5 p.m. Monday through Thursday, and 9 a.m.-6 p.m. Friday and Saturday.